LA CARTUJA Club, set in vast tropical gardens with 3 pools and situated beside Atalaya Golf and Country Club, just a couple of minutes from the beautiful beaches of Puerto Banus, Marbella and San Pedro. Secure gated complex with 24 hour secutity and private secure parking. Located in the most sought after area of the Costa del Sol - the area they call the New Golden Mile and at the heart of golfing in Spain - this exclusive apartment complex was completed to a very high standard. Just outside Puerto Banus and San Pedro and only a few minutes from Marbella and within easy reach of all amenities. 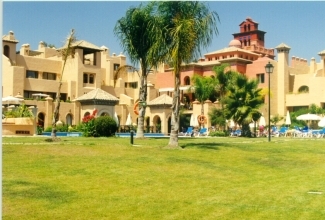 La Cartuja enjoys a peaceful and tranquil location where you can relax and enjoy a hassle-free holiday. Apartments, which are no more than three stories high surround vast tropical gardens, with three swimming pools - all with kiddies area. The gardens and pools may be accessed directly from apartment via patio doors from lounge and from main bedroom on to a private terrace. 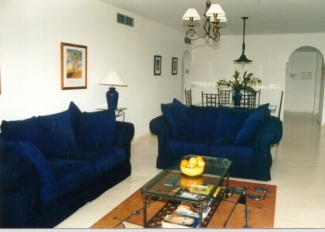 Luxuriously furnished and fully-equipped to ensure you enjoy a hassle free holiday. Two bedrooms: Master bedroom with twin beds convertible to King size bed and guest bedroom with twin beds. Fully-equipped kitchen with dishwasher, microwave, etc. Utility room with washer, dryer and ironing facilities. Private terrace with sun loungers, dining furniture, awnings, and charcoal barbecue, enjoying afternoon and evening sun. Located beside Atalaya Golf and Country Club with its 36 holes of championship golf, and only a couple of minutes drive from El Paraiso and Guadalmina Golf Clubs. Golf packages at discount prices may be arranged for several local courses. There are several restaurants, many within walking distance, and several bars in the area. Puerto Banus, famous for its night life is only a few minutes away. Benhavis - the gourmet capital of the Costal del Sol with dozens of low price restaurants is only 5 minutes drive. The local markets of Puerto Banus on Sat, Marbella on Mon are not to be missed. Water Parks and Fun Parks available locally.